You've most likely seen the movie, but it might be worth another look.Its the story of a killer turned good by the love of a good woman. But the good woman dies, leaving the killer to raise their two small children alone. He struggles to maintain the goodness she has instilled but as he falls on dire circumstances he turns to what he does best--killing for hire. But there is a snare in the contract killings which leads to additional spectacular killings for revenge, aided by a substantial intake of whiskey. The reformed killer's reliance on goodness for goodness's sake has not worked! And this is where the movie ends, without elaboration on this critical point. The audience is left with the humanistic implication that it is the application of man's goodness that has failed. (12) and once for all took blood into that inner room, the Holy of Holies, and sprinkled it on the mercy seat; but it was not the blood of goats and calves. No, he took his own blood, and with it he, by himself, made sure of our eternal salvation. (14) just think how much more surely the blood of Christ will transform our lives and hearts. His sacrifice frees us from the worry of having to obey the old rules and makes us want to serve the living God. For by the help of the eternal Holy Spirit, Christ willingly gave himself to God to die for our sinshe being perfect, without a single sin or fault. 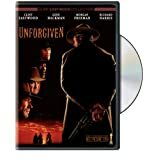 The Unforgiven is a violent movie that won four Academy Awards in 1992, including Best Picture and Best Director. The movie is rife with symbolism but has an unfinished message. The Unforgiven stars Clint Eastwood, Gene Hackman, Morgan Freeman, and Richard Harris.